Gov. Dannel P. Malloy addresses business leaders in the Legislative Office Building. JoAnn Ryan, president of Northwestern CT Chamber of Commerce, is in the background. Gov. 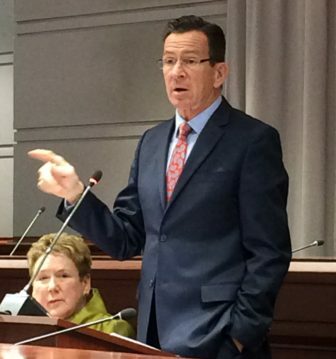 Dannel P. Malloy urged business leaders Wednesday to help him convince legislators to safeguard transportation funds. The governor, who addressed a crowd of more than 300 during Business Day at the Capitol, also said that while he wants to keep municipal property taxes down, cities and towns must shoulder some of the burden of surging teachers’ pension costs. Malloy, whose plans for a major, 30-year transportation rebuilding program is imperiled by a lack of funding, said it is “almost impossible” to get legislators to support a constitutional “lockbox” amendment to ensure transportation funds are not diverted for other purposes. “You have to ask Republicans and Democrats — serving in the House and Senate — why this has not been brought up,” the governor urged business leaders. Given Connecticut’s track record of diverting transportation dollars for other purposes, Malloy added, there is little chance of public support for new revenues for infrastructure without constitutional safeguards. “The real reason is they (taxpayers) don’t trust us” to use the money for transportation purposes. Malloy came forward two years ago with a plan to spend $100 billion over 30 years to transform Connecticut’s aging, clogged highway and rail networks into a modern, efficient system. That $100 billion involved a combination of state borrowing and matching federal grants, and includes both existing funding levels and proposed new investments over three decades. The key to making all of that happen is to appropriate sufficient resources within the budget’s Special Transportation Fund (STF), and particularly its debt service line item that covers the principal and interest on transportation-related borrowing. To cover the first five years of that program — 2016 through 2020 — Malloy proposed replacing an older system of sharing General Fund resources with the Special Transportation Fund with a more generous plan to shift sales tax receipts into transportation. Increasing the retail gasoline tax by two cents per year for seven years. This would raise the levy from 25 to 39 cents per gallon. Increasing the state’s wholesale fuel tax from 8.1 to 9.1 percent. Boosting rail and bus fares by 2.5 percent annually to keep pace with inflation. Implementing all-electronic tolling on highways and using congestion pricing to ensure motorists who travel at the busiest times help to pay for transportation upgrades. Tolling could take up to seven years to implement and raise as much as $18.3 billion over 20 years. Further complicating matters, there now are signs the Special Transportation Fund won’t remain in balance even during the initial five-year ramp-up. Nonpartisan analysts warned last year that the STF was projected to run $46 million in deficit beginning with the 2018-19 fiscal year — Year 4 of the 30-year program. And that was before legislators decided last May to cut this fiscal year’s sales tax transfer to transportation by $50 million to help close a major deficit in the General Fund. The governor’s budget staff estimated in January that the transportation fund would finish this fiscal year, which ends June 30, about $17.1 million in deficit. And while the fund has a $142 million reserve, which could cover deficits for a few years, transportation advocates insist the program needs more resources now. Malloy has said he won’t recommend any long-term funding measures unless lawmakers first put a lockbox amendment on the state ballot. Joseph F. Brennan, president of the Connecticut Business and Industry Association, said he believes most businesses in the state favor a lockbox amendment. “They think it is an absolute priority,” if only to ensure existing transportation funds aren’t redirected, he said. But Brennan was unsure whether businesses would favor tolls or gasoline tax hikes to fund future transportation work, even with a lockbox amendment in place. “When you’ve got these overwhelming state fiscal issues, it makes it difficult to talk about additional revenues for transportation,” he said. Both Brennan and Malloy said there is reason for optimism, though, as Connecticut grapples with huge unfunded liabilities in public-sector benefit programs that threaten to destabilize state budgets for the next 15 to 20 years. Brennan praised the governor for changing the nature of debate at the Capitol. Instead of asking how to raise revenues, officials are becoming more focused on ways to cut spending, the CBIA leader said. “We’re really getting some positive momentum in the building,” Brennan added. Malloy cited anticipated growth at several major industries as cause for optimism. General Dynamics’ Electric Boat shipyard in Groton expects to manufacture as many as three submarines per year in the near future, which should increase hiring there by thousands of workers, the governor said. He also cited anticipated growth in engine production at Pratt and Whitney and new manufacturing work for the marine heavy-lift helicopter at Sikorsky Aircraft in Stratford. Still, the governor acknowledged Connecticut is heading into a difficult period as state government grapples with retirement benefit obligations that were poorly funded for nearly eight decades. Wallingford has become an “oasis” for businesses because of sound local budget management that has produced a healthy fiscal reserve, she said. But Malloy responded that Connecticut shouldn’t shoulder the entire burden of paying for this benefit for municipal teachers. His cost-sharing proposal also is part of a larger plan to redistribute state aid to assist Connecticut’s poorest cities, which have much higher property tax rates than those of Wallingford and most other suburbs. The CBIA and the Connecticut Association of Chamber of Commerce Executives sponsored Wednesday’s Business Day activities.